I read somewhere long ago that everyone should go to Greece at least once in his or her lifetime. I think that same goal should apply to a Mike Wiegele Helicopter Skiing pilgrimage. In fact, I think it’s necessary. Yes, I know it’s big, big coin for most skiers. But so is university tuition, root canals, your daughter’s wedding and a long list of other important but less hedonistically satisfying ways of spending your savings. Whether you give up the cleaning lady for a year, your seat in business class, the second car or your planned facelift, move Greece down the list this year and move powder to the top. Heli-skiing in BC. surely is the most exciting thing you can do on skis, and Wiegele World is the one that’s compared with all others. 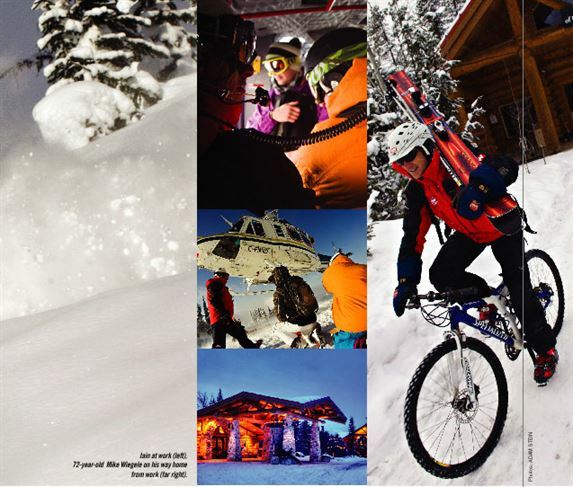 With 10 helicopters in the operation, Wiegele’s share of terrain in the Monashees and Cariboos is more than all ski resorts in North America – combined . Guides are attentive, highly trained and affable, and they’re doled out two to a helicopter. To make it a family affair there’s also cat-skiing for kids and non-heli spouses who want to ski at their own pace. The luxe log cabin accommodation and dining experience at every meal are worth writing about on their own. You need to get in this picture. It’s been almost a year since my photographer buddy Adam Stein, his growling old 4-Runner and I made the trek to Blue River after a few lovely warmup runs at Sun Peaks in early December. 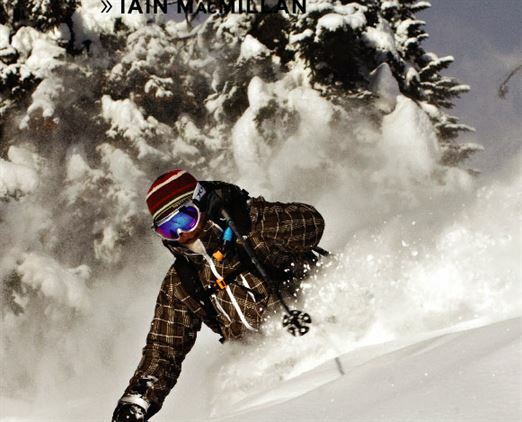 But I remember the powder (and I still dream about it) as if I were in it yesterday. The sky was clear-blue, a lovely soft background, not dominating like you find omnipresent in Colorado or the Caribbean. With desert-dry humidity, -30 felt like -5 and the downy snow in front of us, indeed, as far as we could see, lay untouched. With the noise of the helicopter now long gone, we were completely alone on the mountainside. After we licked into our skis for our first run, Bob Rankin, our lead guide, gave the quiet group a final two-minute talk about where we were heading, what to watch out for and some concluding safety advice – and then he pushed off. “What did he just say?” I said to the group jokingly and just barely loud enough for Bob to hear. But all faces went distant quickly as we watched him silently, wispily disappear into the wondrous alpine scene. Part of an almost suspiciously cordial group, I was up next and within three turns I’d gone from shin-deep to knee-deep. On the lee side of some trees I was soon thigh-deep, and on harder cuts and steeper trees I was effortlessly up to my waist in snow so wonderfully dry and settled I feel like I’m lying while writing this now. But I’m not – and that day was easily my best of the season. Guides have told me (and I’ve probably written about it before) that Americans overestimate their abilities on skis, while Canadians tend to underestimate theirs. I know lots of financially qualified skiers who are perfect candidates for heli-skiing, but because they don’t live and ski in powder meccas like Nelson, Rossland, Revelstoke or Smithers, they’re silently too intimidated to take the plunge. Something that few potential powderhounds seem to know about or take advantage of is the fact that all guides at Wiegele’s must have a minimum CSIA Level III instructor’s ticket and many are at IV, the highest level. And they’re happy to both divide groups up into appropriate skier levels as well as offer simple on-hill and après-ski tips to make the experience as dreamy as, well, my dreams.